Every year when January hits, I have the sudden urge to de-clutter, organize, and re-do spaces in our home. I think this is because the explosion of toys and stuff that came into our home in December leaves me feeling overwhelmed and unorganized. I have found that when things don't have a designated place, then they just end up scattered on the floor, shoved in a drawer, or piled on top of a dresser. So it's important to me to find places to keep all the new Christmas stuff. And since our house is really not that big, this means that old things that are no longer loved need to leave so we can make space for the new. 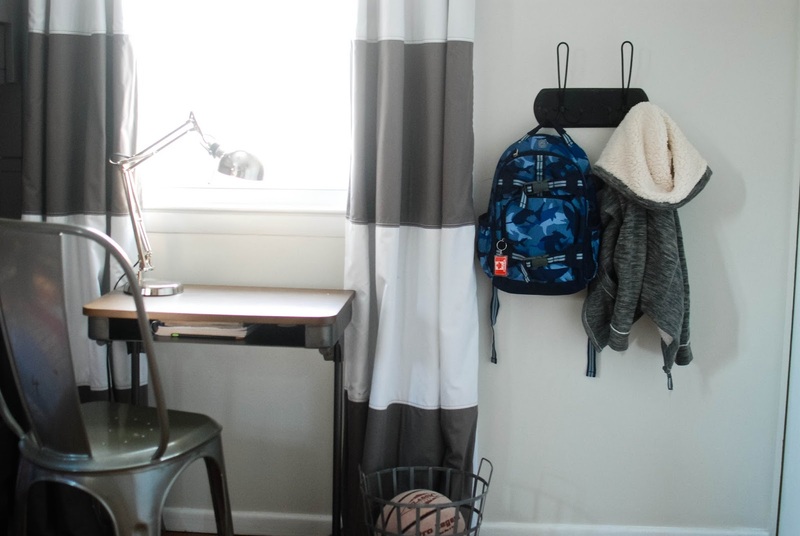 This January was no exception and it was the boys' room that got much of my focus. Their room had not been updated in several years and I felt that they were outgrowing it in some ways. I want the spaces in our home to evolve with us so that they can meet the needs we have in the stage we're in. On top of that, their stuff had just accumulated in their room and it was feeling cluttered, sloppy, and unorganized. 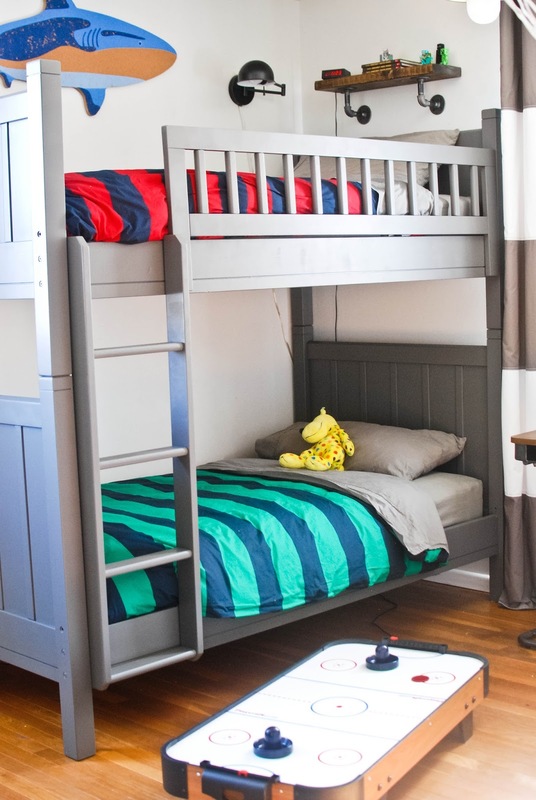 Since they share a room, space is especially limited, so we have to be extra purposeful and efficient in how we use it. The first thing we did was get rid of anything they no longer wanted and then we moved most of the rest of their toys and books downstairs to a designated toy area in the basement. This freed up extra space in their room for the things we needed and wanted in there. 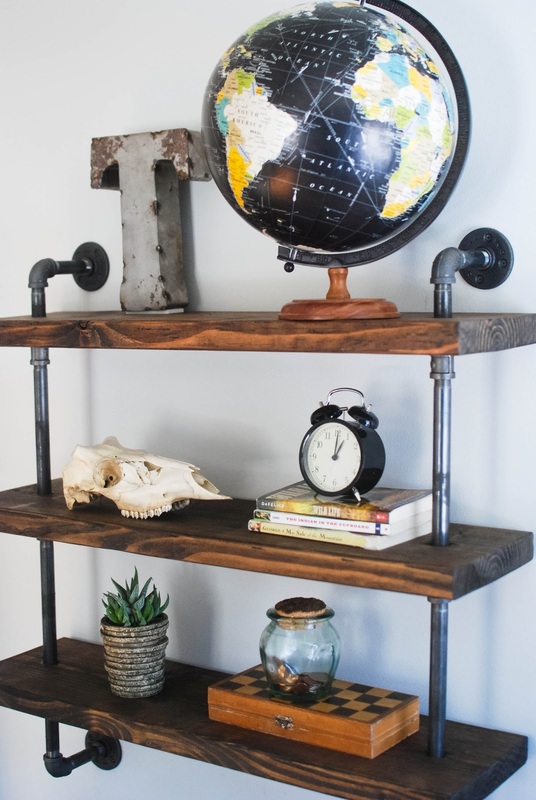 The vision I had for their room was rustic vintage. I wanted a lot of wood mixed with metal, with a little bit of an old-school feel. And I wanted to incorporate their love of sports without making it seem "theme-y" in any way. Tyson and I looked on Pinterest to get ideas of what we wanted the room to look like. I'm pretty sure he would paint the walls orange if I gave him free range in his room, but I can't live with that, so we had to find a compromise. Thankfully, both he and Hudson were on board with giving it a rustic vintage sports feel. Tyson still loves his shark, so although that didn't necessarily fit with the "rustic vintage sport" vision, it stayed because ultimately it's their room and I want them to love it. 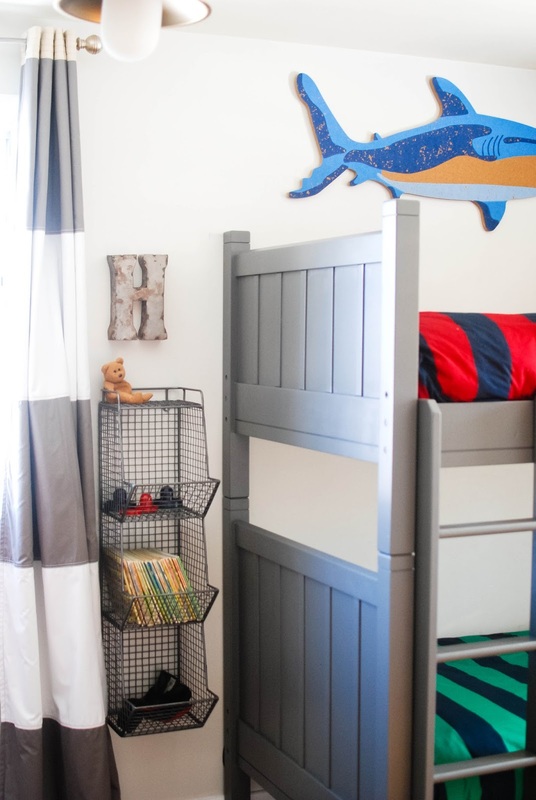 Each of the boys picked their bedding from Pottery Barn Teen. 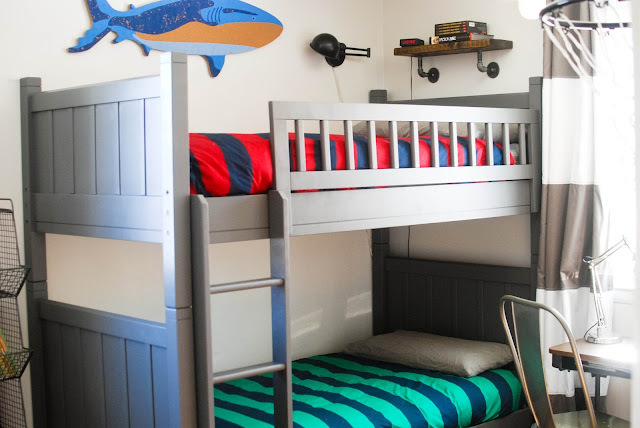 Previously their bunk beds were navy blue, but I wanted them to be a moody gray, so I bit the bullet and spent a weekend painting them. A friend told me about using Zisser 1-2-3 primer so I didn't have to sand it before painting it. In my mind, this is a lifesaver. I hate sanding furniture and sanding bunk beds would be a nightmare. It's been a few weeks since I painted these and I'm very happy that we haven't had any chipping or peeling paint. 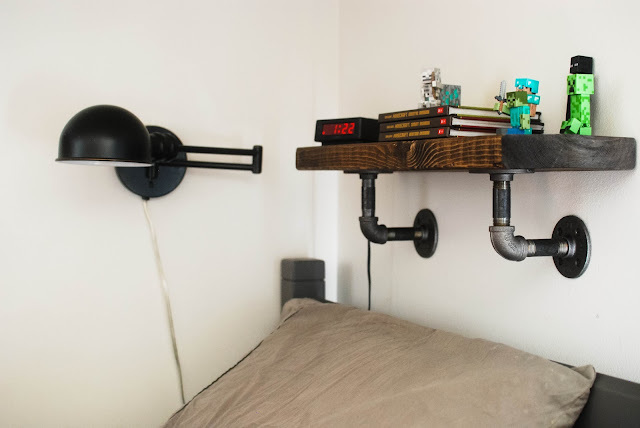 Tyson reads every night before going to bed, so Tim hung his light and built this pipe shelf to hold his books and clock. 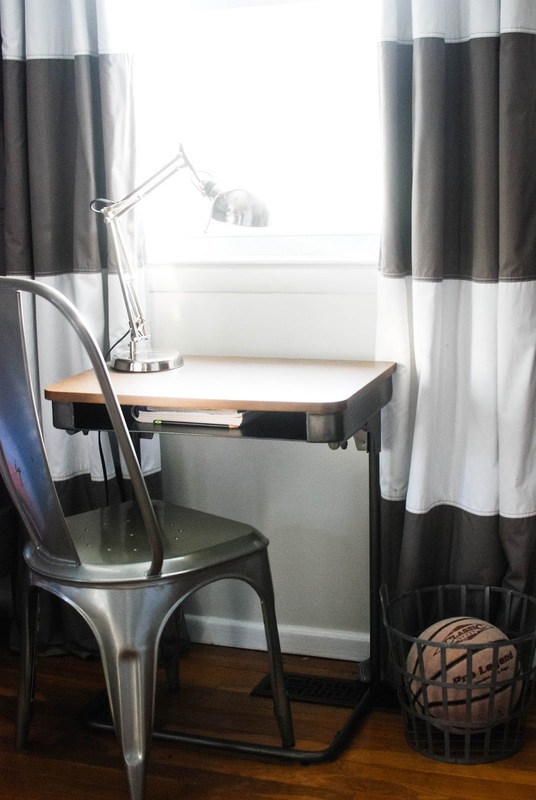 I originally planned to put a nightstand next to their bed, but then I found this vintage style school desk and decided it would be a more useful piece of furniture in the long run. It's nice that they have a small spot in their room now to sit and color or write. 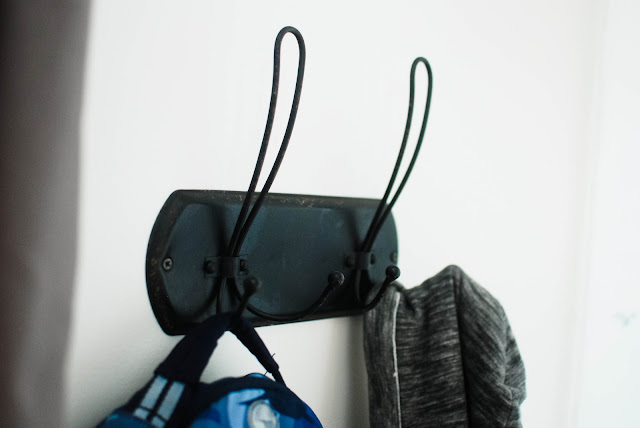 I was sick of always picking jackets up off the floor, so we added wall hooks to give jackets, robes, hats, and bags a specific home. I also wanted their room to be a fun place for them and their friends to hang out. So we built a rustic basketball goal and hung it on the wall. If we had no budget, then I would have gotten them new dressers, but since we do have limits, I just updated this one by giving it a fresh coat of paint. The easiest and cheapest way to update a room is always paint. 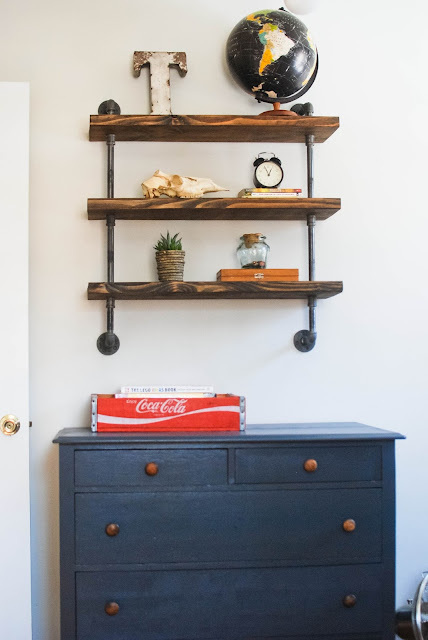 If you don't like something, but can't afford a new one, try painting it! 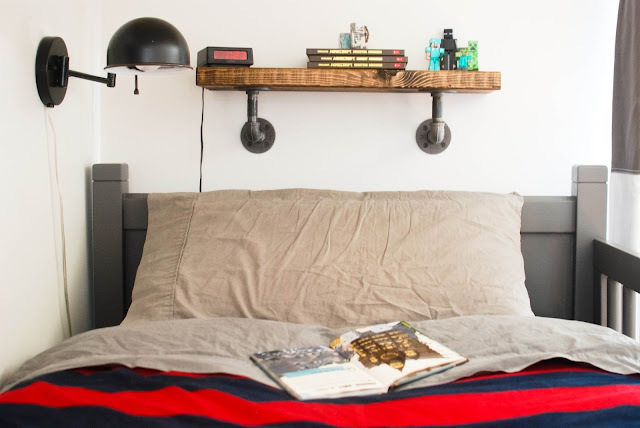 Tim built and hung wooden pipe shelving above the dresser to display some of their things. 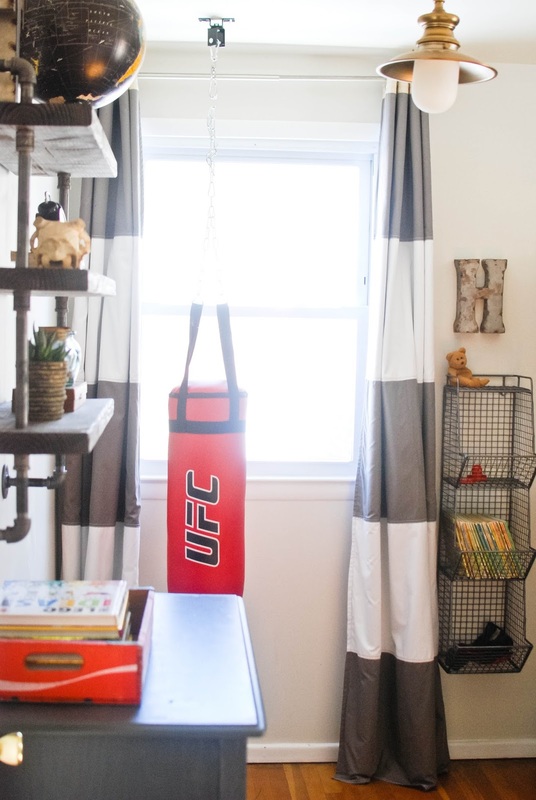 Last Christmas, we gave the boys a punching bag, but never got it hung up so they could use it. 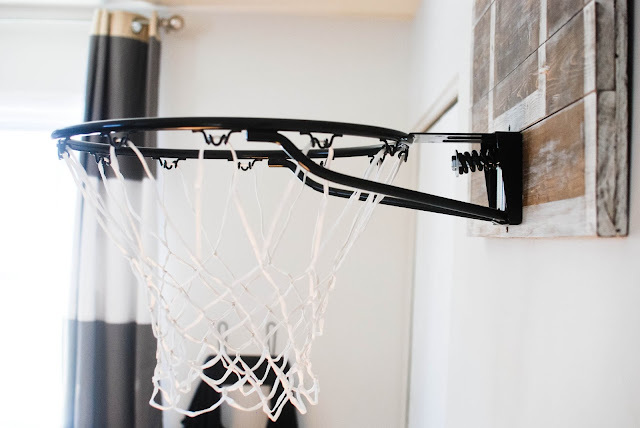 We finally made space in a corner of their bedroom and bought the proper equipment to hang it up. The wire shelves hold books and toys that otherwise would probably end up on the floor. 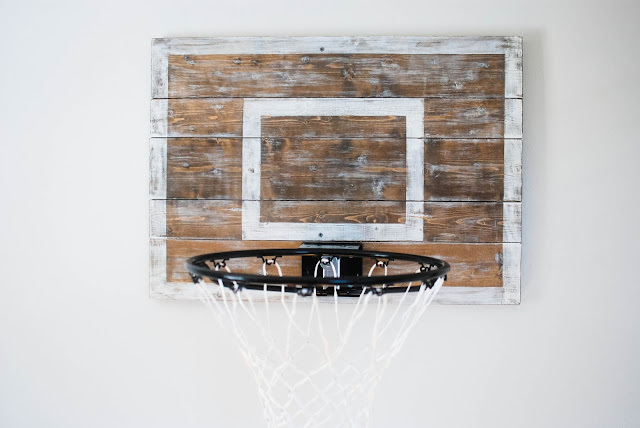 So there you have it… our rustic vintage sports boy room! I hope it's something that they will love and enjoy for several years to come. I want to see closet!!! I have been checking daily for a new blog post! Love their new room. My favorite might be the gray bed and basketball goal! It is the perfect color.